Working with international visual artist Simon Mckeown, PRG XL Video supplied a high brightness outdoor building projection and mapping system for a projection on to the College of Commerce at Union Quay in Cork. This was done for a special arts event entitled Cork Ignite, on 18th September, in front of a large public audience who were wowed by the spectacle! Mckeown, who also lectures in post production and animation at Teesside University, was originally invited by the directors of the National Sculpture Factory and Create Ireland to meet with them in Cork to discuss the project. He proposed that they create an outdoor projection event to be held on Culture Night 2015. Funding for the event came from Teesside University, and Ignite, a partnership of the Arts Council, Arts & Disability Ireland, Cork City Council, Galway City and County Councils, and Mayo County Council, whose aim is to showcase the talents of people with disabilities, including artists and performers. During Spring of 2014, Simon Mckeown worked with a group of participants from COPE Foundation and other disability organisations to create a collaborative work based around stop frame animation, shadow puppetry, art work and video. Work from this workshop directly and indirectly influenced the content created by Mckeown’s team for the Cork Ignite projection. His creative team included Craig McMullen, sound specialist Nigel Crooks, concept artist Kameliya Minkova, Phillip Wray, and David Archibold. 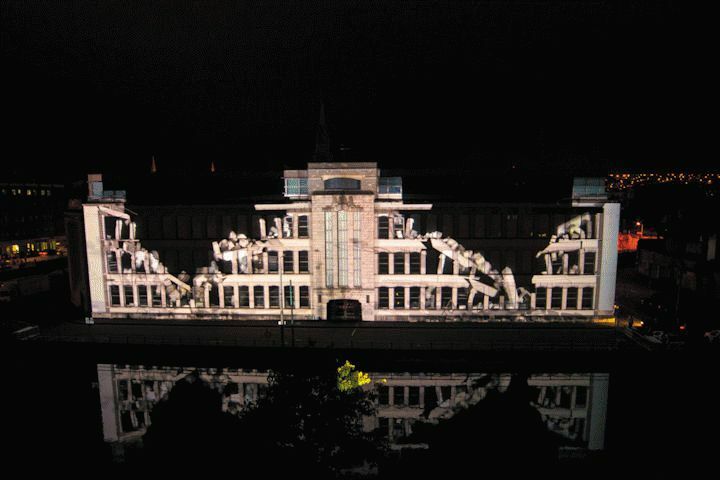 To realise Simon’s idea of creating a building projection on the exterior of Cork College of Commerce, he contacted PRG XL Video senior account manager, Paul Wood, who put together the technical specifications for projection and playback. Firstly PRG XL Video’s team, including mapping expert James Cooksey, created a map of the building using a combination of building drawings and photographs for the content renderings. Once the map was complete, Mckeown’s team formatted their content to match the building map, and the completed content was played-back using Milumin media servers, and Mad Mapper for final mapping tweaks on-site. To cover the entire front of the College of Commerce, six Barco HDQ-2K40 projectors were used in two stacks of three, outputting a total of 240,000 Lumens! These were installed and aligned by PRG XL’s projectionist Peter Tilling. Two nights before the main event, projector alignment was carried out, and a content run-through/rehearsal took place the night before the event.